An 80 year old total badass from the southern Russian region of Kabardino-Balkaria, whose major export is total badassery, kicked and head butted a bear which had attacked him. 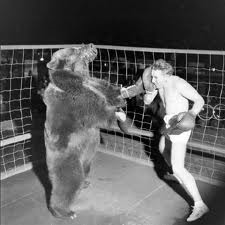 The bear then tossed the 80 year old Yusuf Alchagirov off a cliff. And Yusuf survived and is currently munching down pies by the dozen made by his family. Now here's my favorite line from the press report in The Guardian, "It is not known whether the bear suffered any lasting injuries." Figures the media is concerned about the bear when it just tried to make poor Yusuf a screaming pot pie. There's a Japanese movie from the 70s that is the biography of a real person...and its name is "Karate Bear Fighter". Sadly, one can't be sure the Guardian was joking.